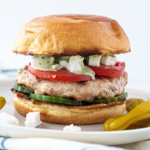 These Greek chicken burgers have seasoned patties and are piled high with your favorite Greek flavors such as feta, cucumbers, and tomatoes. Add a drizzle of green goddess dressing to take this burger over the top! Make the burgers – In a large bowl, and using your hands or stiff spoon, blend the ground chicken, onion, oregano, garlic, lemon juice, beaten egg, and salt and pepper. Portion out four equal burgers, and form them into flat patties. Set aside. Pre-heat your grill to medium heat, or a cast iron skillet, over medium stovetop heat. If using a skillet, wait for it to pre-heat before adding 1 tsp of avocado or olive oil. Add your prepared burgers to the grill or skillet. Cook 3-4 minutes before flipping. I am a fan of toasted buns, so this is where I would say, start toasting your buns! Cook the burgers an additional 4-5 minutes on the second side. The best way to test their doneness is to poke them. If the juices run clear, they are done. Assemble your burgers by layering your favorite Greek toppings such as crumbled feta, tomatoes, cucumber slices, and pepperoncini. Top with a drizzle of green goddess dressing for an extra layer of flavor!